Weeknight dinners has to be quick and easy. Because my commute from work gets me home around 7pm, my dinner is either pre-made and portioned on prep Sundays…or some nights, I get to cook a quick and easy dinner. 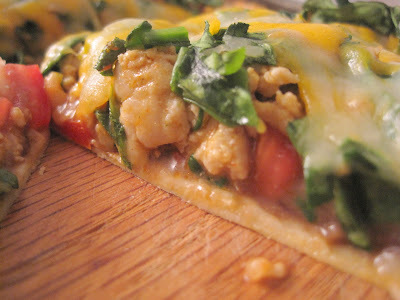 I have been craving Mexican food lately so I wanted to make Mexican Pizza or Enchiladas. The second option will not have me eating dinner by 8pm, so it was an easy choice. 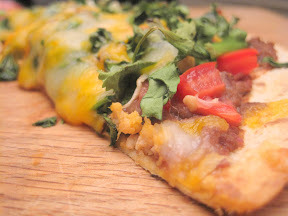 Quick and healthy Mexican Pizza it is! 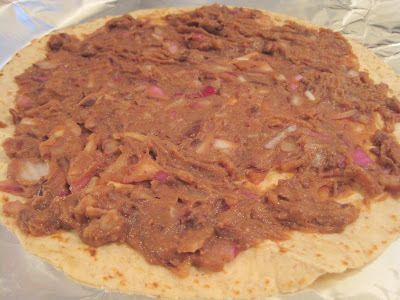 First, I mixed 1/2 cup refried black beans, 1/4 cup onions and 1 tsp taco seasoning (or to taste). This base is what makes this pizza very tasty. 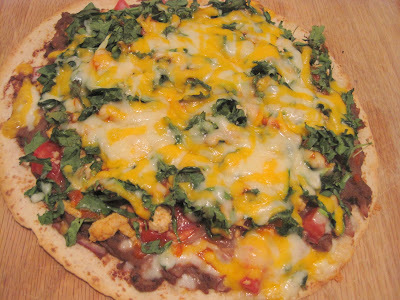 I put La Tortilla Factory Whole Wheat low carb tortilla on a baking sheet and spread the beans on top. Next, mixed 1 fresh tomato (finely chopped) with 2 minced garlic and layer it on top. You can also add chopped bell peppers. Grabbed a handful of chopped spinach and layer it on top. 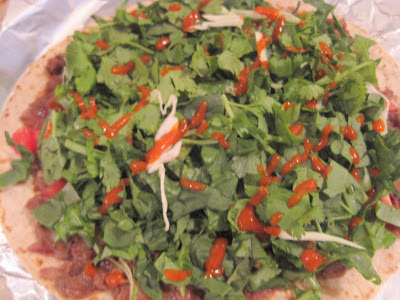 I added cilantro and hot sauce (optional). Last layer is the cheese. I used Mild Cheddar and Monterey Jack (Mozzarella would be good too instead of Mild Cheddar). Put the baking sheet and the pizza in the oven in 375 degrees for 10-12 min or until cheese is melted. This was an easy and very tasty meal. I made another pizza with a turkey topping, shared with the fiance. To make the topping, you cook ground turkey with coconut oil, then add water and taco seasoning, then simmer for 5 minutes until most of the water is absorbed. Layer on top of the tomato and garlic. 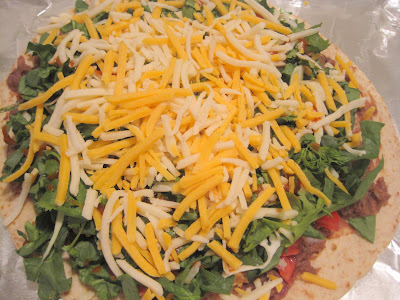 You can use regular pizza dough if you want and make more of the ingredients for the layers. You can add as many toppings as you like, or change the combination. Now I’m off to do more studying. 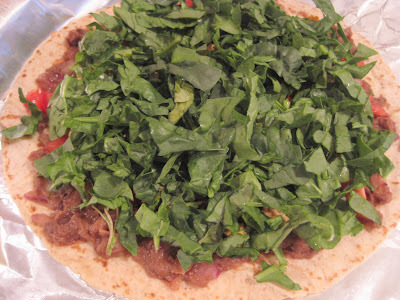 That mexican pizza looks SO good! Dang, IBS…I love refried beans. 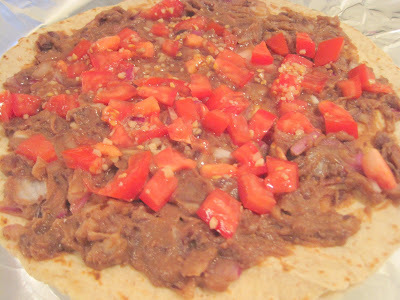 i love your mexican pizza idea – i have some refried beans and onions and pizza dough – maybe tonight! Let me know how it turns out for you Lynn. I am obsessed with La Tortilla Factory tortillas..so much so that I ended up scoring some for free…love that they are only 50 cals. looks delish! 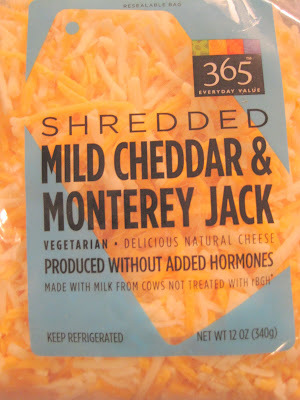 i think i will add shredded beef to mine since the bf like meat but this is a great idea for a quick an easy meal! I added ground turkey for the fiance’s pizza. I suggest adding the taco seasoning to the shredded beef as well, so that there’s more flavor. I use Bearitos brand for the taco seasoning. 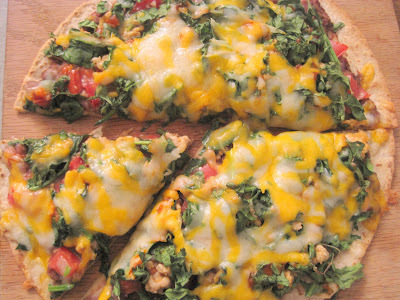 I love whipping up pizzas on a busy day… you can literally put anything on a pizza and it will taste great! 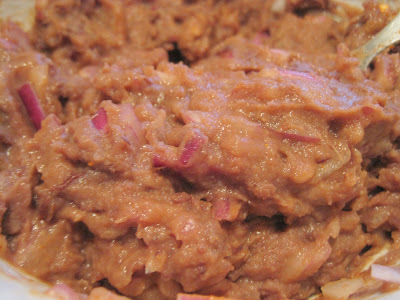 I have never tried refried beans before… this might be something that gets added to my “Try” list. I used refried beans because it was convenient and quick. You can also use organic black beans and mashed it up, this is an even healthier version. You should enter my La tortilla giveaway! Hey Lea! Just found your blog and love it! I also adore coconut. : ) Your Mexican dish looks amazing – love recipes that I can try on food blogs. Yum! What a grat little quick dinner! I’m for sure adding this into my rotation next week! Ole!